The last conversation we had in person, just the two of us, happened on an ocean-front balcony. We were watching the waves roll in, relishing the warmth of the late February sun on our skin. It was a Sunday. The next week would bring more clinic visits, hospital appointments, and my return to Texas, but for that one afternoon Jess and I talked about all the things sisters talk about. Clothes, shoes, and makeup were our focus; she was giving me all her best tips, tricks, and pointers for creating a travel-worthy wardrobe for my upcoming four-month road trip with Anna. She told me my current wardrobe screamed “tired teacher” and that she aimed to turn me into a “structured businesswoman.” I laughed at her, but made detailed notes nonetheless. Two months later, almost to the day, I awoke in the wee hours of the morning to the phone call I never wanted to receive. She was gone; my sister had slipped away during the night—she’d taken the “second star to the right and straight on til morning,”as Peter Pan says. In a hotel on the Las Vegas strip, my heart shattered into a million pieces that April morning. When I’d texted Jess a few weeks before and told her we were adding a stop in Vegas to the itinerary, she replied, “yes to Vegas. Always yes to Vegas.” It was one of her top bucket-list destinations and we were both shocked that I’d make it there before she did. (Like Texas, Las Vegas was one of those places I had absolutely no desire to visit.) So when I woke up to the worst news of my life, it was sort of fitting that we were in Las Vegas. As the new reality of living in a world without my sister settled over me, the desire to absorb the essence of who she is and was flooded every fiber of me. I couldn’t let her go; I couldn’t let her be forgotten; I couldn’t let her slip away completely. Mid-morning, I rolled over on the bed and looked at Anna. “Yes! Let’s do it,” was her response. 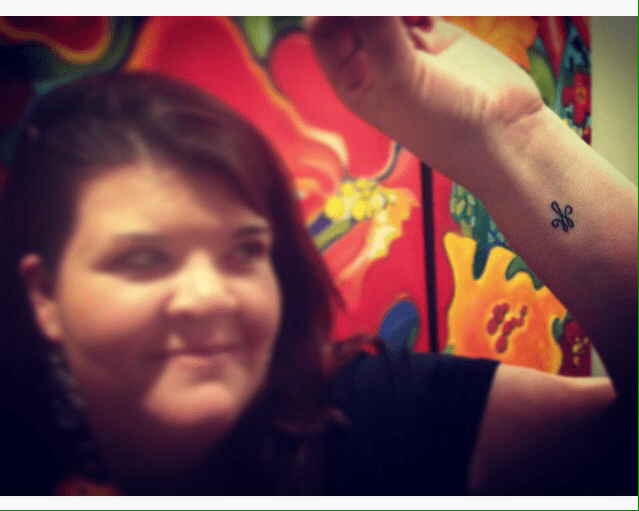 Enter our wise friend Jana who talked us out of spontaneously getting tattoos in Las Vegas. She talked us off that ledge and made us an appointment with her tattoo artist in Minnesota, buying us a few weeks to really think this through. Back in March, my siblings ganged up on me in a group text and threatened to oust me from the family if I didn’t get on board with their idea for a sibling tattoo. Even so, I resisted. No way was I getting a tattoo. Nope. Not happening. Now, there was no question in my mind. I was getting a tattoo and I was getting it to memorialize my sister. At first I considered a shooting star because Jess had been talking about getting a star tattoo for months and now I thought of her as a shooting star, streaking across the sky. But I’ve never actually liked the shape of stars. When I flew home for the memorial service at the end of April, I still hadn’t decided on a design that would encompass the memory of Jess without being cliché—something she was certainly not. As I was looking through some of her things in her bedroom, I found it. Years ago, Jess spent a lot of time perfecting a logo for her photography business. Finally, she’d designed a logo that was a version of her first and last initials—JL—that didn’t look like her initials but rather a design akin to a fleur-de-lis. I found it drawn on a random piece of paper and knew that was my tattoo. Simple, meaningful, and something I could look at for the rest of my life. It’s been emblazoned on my wrist for just six days, but the more I look at this tattoo, the more I see a star in it. Like a star, it has five points—all in the right spots. And that makes it even more perfect. My sister was a star. And I can only imagine that she is even more so now. She is forever my star. Beautiful! I think that says it all. I love you. You honor her well. She would be proud. Keep writing my friend. It is good for all of us. Also, I will take any and all tips about not dressing as a tired teacher. 😂 Truly, I love you with all of my heart. I have no words except this is so beautiful! All of it! This tribute has Breath and Life and Continuance….if that’s a,word…I love your wielding of thoughts and essence….beautiful!!! Wow! You honor her well! I’m honored to be walking this road with you. I love my #SolidaritySister tattoo. Us getting them together on the #EpicBookTourTPD was perfect. “Second star to the right, and straight on ’til morning” should be the only GPS instructions we follow from now on. I bet we’ll go places we never even dreamed of! Oh wow. What a beautiful tribute.